For some time now, I have been looking forward to hearing the tapes of the CD you now hold in your hands. The three musicians on this recording, friends of mine, were all enthusiastic about the results. I know them to be perceptive self-critical musicians, so their enthusiasm made me more than curious. March Blues is a gem of a recording. With its subtle complexities of angles and colors intrinsically integrated into the compositional whole, it shines with a deeply satisfying and lasting brilliance. Pianist and composer Larry Porter - bassist Thomas Stabenow - and drummer Rick Hollander - are all major players on the German-European jazz scene. They have worked together in a variety of contexts over the last several years, developing the familiarity and intuitive empathy necessary within the intimacy of a piano trio. After the first few listenings to this recording, and upon imagining how I would approach the writing, I found myself continually coming up with superlatives for the playing on every piece. I felt the comments would become redundant. So, a few general observations about the players on this recording seem appropriate here. Rick Hollander has an off-the-wall logic to his playing which continually surprises me. What sounds straight-ahead turns out to be interlaced with delightful curves and angles. And it all fits and fills out the parts. Thomas Stabenow is the consummate accompanist. The intimacy of the trio format allows him the solo space normally given a horn player. He responds with depth, sensitivity, and clarity. Steeped in the traditions of Jazz, and other musics, Larry Porter's playing has developed into an expressive and richly creative personal style. For me, Porter has a poetic quality to his writing and playing in which I can envision stories in sound. With his ballads, I can often conceive of lyrics breathing inside the melodies. The CD might also be titled Blues and Ballads; four of the ten compositions are blues, and four are ballads. Eight of the ten are originals written by Larry Porter. March Blues is one of a series of twelve blues that Larry wrote. They are studies in bi-tonality, each written in a different key, representing a particular month of the year. The name instantly struck me as a play of words on Benny Golson's Blues March. The feeling here is more like an early Spring stroll, however. The playing here is tight and beautifully controlled, the three walking leisurely together, and enjoying each-other's company along the way. The second of Porter's compositions, So Near Yet So Far Away, begins with a somber, haunting, Scriabin-like solo piano introduction leading into the trio's rendition of a theme tinged with melancholy. There are moments during this piece where I lose the sense of there being accompanist and soloist. Instead, there is the feeling of the three soloing together. One of the pleasures of this recording is this constant commingling of roles. 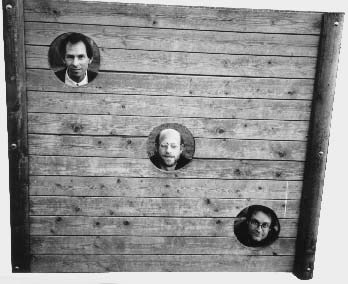 The compositional quality of Porter - Stabenow - Hollander's improvisational playing, their ability to fill out the parts with the "right" textures and dynamics gives the music a sense of inevitability. The medium tempo Sky Blues is aptly named. It starts firmly and funkily rooted in the earth, and then soars skyward on altered changes. The feeling of the group shifts between funky and suspended. Waltz For Mabel (pronounced ma belle) was written for a certain Spanish lady during Porter's two year sojourn in Spain. It is a bright medium-tempo jazz waltz in the finest tradition of the genre. Eadie Is A Lady is dedicated to Larry's mother. As a musical portrait, the upbeat and bluesy first section encompasses the lively, vivacious side of her personality. In the ballad-tempo second section the mood is more contemplative, touching more on the softer emotive, lyrical side. Menuet is a piece transcribed from J. S. Bach's English Suite #4 for keyboard. Arranged by Porter for the trio, it starts off much in the tradition of the original composition, in a stately 3/4, and then is transformed into a lively samba in 3/4. After solos by Larry and Thomas, the composition returns to the original theme and tempo. Frank Loesser's Spring Will Be A Little Late This Year is the only standard on the album. Larry was attracted to the song after hearing Abbey Lincoln sing it at a live concert in Munich. Porter commented, "She made the song sound as if it were written yesterday. She expressed so much just in the way she would sing a single note. It's such a feat to sing it so magically. It's the unexplainable that captivates you." In the trio's version, the composition is pared down to the essentials and played with poignant simplicity. October Blues is another bi-tonal blues (see comments on March Blues). It is played with a straight-ahead feeling, slightly unsettled by an autumnal sense of wistfulness. The title The River Flows, But Does Not Wash Away The Moon comes from a Chinese calligraphy sent to Larry by a long-lost close friend from Porter's college days. The title suits the composition's impressionistic brush strokes and the particular blend of hues and colors of the trio's playing. Homer Blues is the name the street Larry Porter lived on in Munich. With its feel of ragtime and stride, this fifteen(?!) bar blues is an unabashed digging into jazz roots without becoming entangled in them. The same might be said of the entire CD. It's a beautiful set of creative music grounded in a tradition that allows for, and often insists upon, personal growth and flowering. Here for your listening pleasure is quite a unique garden of delights. Bassist Thomas Stabenow's playing credentials are impressive, having played and recorded with many of the major players of the American and European jazz scene. They include Johnny Griffin, Charlie Rouse, Clifford Jordan, Lee Konitz, Ack Van Rooyen, Billy Cobham, Sal Nistico, Tom Harrell, Albert Mangelsdorff, Wolfgang Dauner, and Klaus Doldinger. Stabenow has established his own record label, Bassic Sound, and produced the First German Realbook. Thomas Stabenow lives in Munich, Germany. Drummer Rick Hollander started playing drums at the age of nine. He lived and played in New York City from 1979 through 1987. Rick moved to Europe in 1988, and currently lives in Munich. He has played with Woody Shaw, Arnette Cobb, Roy Hargrove, Steve Houben, Bob Mover, Rufus Reid, and Robin Eubanks. His own group has recorded five albums, the last two, including the soon to be released Once Upon a Time, for the Concord jazz label. Larry Porter was born in Cleveland, Ohio. He began piano lessons at the age of six. He moved to Boston in 1971, where he and vibraphonist Tom van der Geld formed the group Children at Play. Porter moved to Munich, Germany in 1973. During this next period, he worked with Mel Lewis, Sal Nistico, Kai Winding, along with various groups in the local and European jazz scene. Porter spent 1976 in Afghanistan and India studying the respective music cultures. In 1977, Larry moved to New York City where he worked as pianist in the jazz scene, and as sarod and rabab player in the Indian music scene. He also worked with dancer Merce Cunningham. Larry returned to Munich in 1980, where, along with work with Thad Jones and Airto Moreira, he again found himself working in the local scene. In 1981 he formed a group with LA expatriate alto saxophonist Allan Praskin. Porter moved to Spain in 1983, where, with Praskin, he recorded his first album as co-leader. He moved back to Munich in 1985, where he recorded his second album as co-leader. During this period, he worked with Hannibal Marvin Peterson, Don Menza, Al Cohn, Benny Bailey, Art Farmer, and Leo Wright. Porter worked with Chet Baker's group from 1986 through 1988, and worked with Archie Shepp in 1991 and 1992. Larry Porter's first album on enja, Porter-Praskin Quartet with Sal Nistico, Sonnet for Sal, was released in 1994. In June 1994 Larry moved back to Manhattan. Cleveland-born pianist Larry Porter, a musical vagabond who’s bounced around the globe since he left his hometown, leads an intimate and inventive trio session with bassist Thomas Stabenow and drummer Rick Hollander, veterans with Porter in the American and European jazz scenes. That’s likely what gives the ten original selections on this album their unique flavor. Porter’s keyboard touch is airy and akin to classical technique. His dreamy melody lines move along unexpected paths and he phrases like a singer. He incorporates the fruits of world travels (particularly Asia, where less is more) that perhaps account for his centeredness and the simplicity of his statements. He’s lived and worked in Afghanistan, India, Munich, Spain, and, now, New York, and has collaborated with top jazz innovators, including Cleveland native Benny Bailey, Chet Baker, Archie Shepp, and many others. In his note sent with his CD, 44-year-old Porter writes, "I love beauty. I don’t know if this kind of music can make a ripple in today’s aggressive times, but there it is." Indeed, Porter creates poetic passion instead of the forceful dynamics favored by most New York jazzmen. Porter’s trio is of one mind, their subtleties making this his most romantic recording to date. Someone should put lyrics to Porter’s pretty originals; he’s creatively crafted tunes that could become standards. 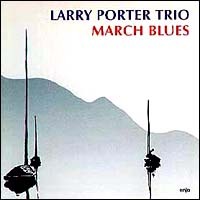 Larry Porter Trio - "March Blues"
Beneath the airy surface of this piano trio album lies the work of three highly skilled and creative musicians. Two are long-time expatriates--pianist Porter (although he recently moved back to New York) and drummer Rick Hollander have lived in Germany for several years--while the third member, bassist Thomas Stabenow is a mainstay of the European jazz community. With the exception of a jazz reading of a Bach minuet and Frank Loesser's "Spring Will Be A Little Late This Year," eight of the album's ten compositions are originals. Of those eight, four are blues that feature various twists on tonality and form. Reharmonized from the beginning, the Bach minuet shifts from a dignified 3/4 feel into a kinetic samba framed by Hollander's expansive drumming, which is busy and could even be called melodic, but with each minute detail perfectly placed. "So Near Yet So Far Away" begins with a fragile, dissonant piano solo with an almost formal attitude. It eventually evolves into a gorgeous ballad that subtly recalls the work of Gershwin, Arlen and Carmichael. Despite the members' tendency towards musical reflection, they can also swing well, as on "October Blues," where Porter explores bi-tonality with deft, spacious phrases and a sure but harmonically inquisitive left hand. A delicate balance that is adventuresome yet eminently pleasurable.